Your custom home begins with your imagination, a sketch, smart phone photos, screenshots from Houzz or Pintrest. Let us help you create / transform a business space to reflect your business identity and meet your specific needs. Our professional staff will take extreme care in overseeing every detail while the work is being completed on your project. Start your home design process by describing your dream home to us. Bring your wish list of features and room requirements. With Trade Wind Builders, having a true design / build firm working as a team of dedicated professionals, quality, cost, and scheduling are all considered from conception to completion. Cost savings are achieved with design and construction personnel working and communicating as a team to evaluate alternative materials and methods of construction. On-site management and a full office support staff provide Quality control of your home improvement project. Our attention to detail is maintained by our entire staff at Trade Wind Builders and their continued involvement in your project during the construction phase. 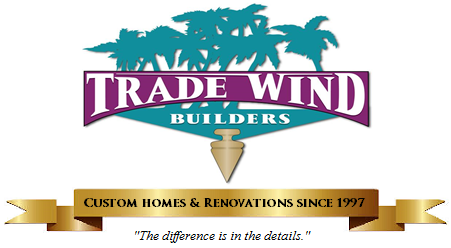 You can expect the best service and attention to the details from Trade Wind Builders. At Trade Wind Builders, on average, your project is completed and delivered faster than the traditional method of architectural firm design/contractor builds. Whether it’s a custom condominium renovation, custom home or residential remodel, come see us at Trade Wind Builders, and let us start you on your way to the project of your dreams. Experience the difference when working with professionals. We have continued to build on our reputation throughout the Merritt Island, Cocoa Beach and surrounding areas of Brevard County, FL. Working with the Trade Wind Builders Family, your project becomes our passion. We look forward to building with you. You’ll see the difference is in the Details with TWB!